SoftDek Safety Surface is up to 4 inches of closed-cell energy-absorbing cushion that provides a safer play environment for children on and around pool edges and water-play equipment. SoftDek stands up to repeated use while maintaining its shape and comfort. This system is applied under Natare's dynamic NataDek flooring system, which adds the water-tightness and slip-resistance that every aquatic facility is looking for in a wet-environment flooring system. Place SoftDek and NataDek systems in areas such as zero-depth pool entries, waterslide runoffs, splash zones or locker rooms. The new 160-page Recreation Supply Company commercial swimming pool catalog offers any item you might need for your pool facility, aquatic athletics or swim programs. Hundreds of new and updated items have been added for 2007. Ordering is easy and convenient. In-stock orders are typically shipped within one business day. Shower Tower—outdoor showers for beaches, parks and pools—won't rust or corrode. Ultra-tough polymer construction with color molded through won't chip, crack or fade. Self-closing push-button valves offer hands-free operation, providing up to six user stations per tower. Select either showers or foot-wash stations to best serve your customers. Handsome design is vandal-resistant and withstands even the harshest conditions. Easy to install and maintain, Shower Tower proves to be a winner for long-lasting, durable outdoor showers. Standard and custom colors available. Whitewater West Industries is the only manufacturer of waterslides that are perfectly smooth inside and out. Whitewater West's leading SilkTekTM technology provides a superior appearance and decreases maintenance costs while delivering the ultimate ride experience through smooth joints and consistent thickness. Add some SilkTekTM to your facility with Whitewater's award-winning PoolSiderTM waterslide. Heliocol is the world's largest solar pool-heating manufacturer and creator of the Individual Tube DesignTM . Heliocol's exceptional 12-year warranty, full-flow design and commitment to customer service are only a few of the reasons Heliocol was chosen to heat the pools for the 1996 and 2004 Summer Olympic Games. Heliocol solar pool-heating systems work in any climate, are available in three colors (black, gray and terra cotta), and offer payback in as little as three to five years. Save thousands on your pool-heating bills with Heliocol Solar Pool Heating. Clean water. Minimal closed-pool time. Pool operators who use a non-chlorine shock containing potassium monopersulfate (MPS) gain both benefits. Testing MPS-shocked water can be problematic when trying to determine chlorine levels with the DPD or FAS-DPD method, as the MPS reacts with the DPD #3 reagent used to determine the level of chloramines, but not with the DPD reagents used to measure free chlorine. Thus results indicate the shock treatment has increased the odorous, irritating form of chlorine, when really the residual MPS is being read. To avoid being closed for what looks like a chloramines violation, use Deox Reagent (R-0867) from Taylor Technologies to overcome interference from MPS. 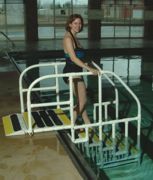 The Pro Pool LiftTM , manufactured by Aqua Creek Products, is the only aquatic access lift on the market that is independently certified to meet or surpass the requirements of the ADA regulations. Buy with confidence knowing that the lift you purchase comes with independent certification from Wylie Labs, indicating that you meet or exceed the requirements of the ADA. Contact Aqua Creek for more information or for a list of certified distributors.